There's something about a self-published game. Your average game company, they make games, and it's their job. Yeah, they might love the job, but it's a company, it's a business, and somewhere between the game designer scribbling notes on a cocktail napkin and the company's spit-and-polish version, some of the soul leaks out. But when you're playing a self-published game, the soul is still there, all of it, in its naked, unrefined glory. A self-published game jumps up and says, 'I love doing this!' You can feel the passion with a self-published game, in a way you never can with a big-press publisher with shiny bits of plastic and varnished, splashy, colorful game boards. That's the first thing you'll notice when you pick up Arctic Scavengers. You can look at the box and feel the creative fever that went into it. You can flip through the rules that look like they were printed with love on the office copier. You can rifle through the cards, with their amateur-but-really-damned-cool art. You can even just look at the box, with its wrap-around graphics that look like the creator applied them himself with a ruler and a glue stick. And you can feel the love that went into the game. And then you'll play the game, and you'll be blown away. I know I was. Arctic Scavengers starts off with one of my all-time favorite themes - post-apocalyptic survival. Only instead of surviving nuclear winter, now humanity is surviving actual winter, thanks to some crazy global climate change. People are reduced to hunter-gatherer tribes, and you have to gather a gang of thugs, scavengers and refugees and carve out your own little piece of end-of-the-world frozen Hell. Every person you hire can help. Refugees are the weakest, but they can man a shovel and dig through the snow to find medicine. Scavengers are decent at everything, great at nothing, but when you need 'em, it's handy to have 'em. There are lots more characters to recruit - snipers, sled teams, group leaders, hunters and a whole lot more. The really good ones are scarce, and you'll have to fight the other gang leaders (also known as the other players) to get them. The cool thing is, after you play a card, it goes into your discard pile, and when you run through your deck, you shuffle and keep going. So playing your medical supplies and a hunter to recruit a saboteur isn't a bad call, because you'll see them all again soon. You'll end every turn with an empty hand, and redraw, so while you're trying to build up your gang (you win with a high head-count), you're also trying to nab powerful cards that can help you win fights, draw more cards, and dig through the junkyards of humanity's collapse. There's a ridiculous amount of stuff going on for a game that's this easy to learn. Each card has the potential to help out in one of four actions - drawing more cards, digging through junkyards, hiring more help, and fighting - and you won't be able to afford to do all of them well in any given turn. You'll need to beat the other players to the really capable hired help if you want to have a chance in the fight, but if you don't dig in the junkyard, you'll never get the meds you need to lure a sniper team into your little sociopathic family. Some people have compared Arctic Scavengers to Dominion, in that you're constantly building your deck and playing it at the same time, and to a certain, limited degree, that's a fair comparison. But where I think Dominion is a little dry due to a minimal amount of interaction, every turn in Arctic Scavengers ends in a brawl. You can't help but interact with the other players, and even better, you can totally hose them while you play. You can sabotage their equipment, snipe their best fighters, and beat them to the wolf pack. You can bluff by playing a hand full of weak refugees, and get everyone to skip the recruitment phase to try to beat you to a card that you don't really want anyway. I can't even adequately describe how much fun I had playing Arctic Scavengers for the first time. You know you enjoyed a game when you spend the next three days wishing you could quit whatever you're doing to go play again. There are games I like to play, but at least for now, Arctic Scavengers is edging them all out. I have a half dozen unplayed games waiting for reviews, and yet I don't even want to finish reading the rules. I just want to play Arctic Scavengers again. 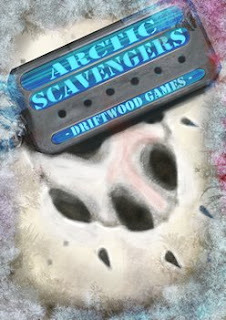 Word on the street is that the creator of Arctic Scavengers is working on an expansion. If it's even half as much fun as the base game, I know I'm in. No cons today. If you want to read some cons, you can check out The Worst Case Scenario game. Sounds like a lot of fun. Dominion was what I immediately thought of, but it sounds like there is some of the "screw your opponent" found in Bootleggers and Dicetown. Thanks again for the review. Played the game myself, and had some fun. My biggest concern is the replayability factor - it was fun, but I'm worried about how fast it'd get to become stale since turn time is just a tad longer than I'd like. Then again, first game so that could change with a few more rounds. "hi.. just dropping by here... have a nice day! " Hi! Deleting your spam post! Fade back into obscurity, jackhole! I got to play this the other day; it was everything our host said it would be. Tao-Starlit Citadel, it was a very cool game and I got a peek at some material in an upcoming expansion. Your replayability concerns will be handled by the expansion. It opens the game up in a very new way. Card Game Review - Bang! Board Game Review - Attack!